February 20th, 2010 by KTU | Filed under 4. Components and Systems, Notes on Approaches. Punched into the middle of this is a thermally challenged window assembly. The pink stuff (whether pink or not, i.e., fiberglass, cellulose, spray foam) is a fantastic insulator. The problem is that, as you can see from the illustration, there isn’t very much wall cavity left to fill with insulation. In my project, there is a shocking amount of wood and steel in my walls. 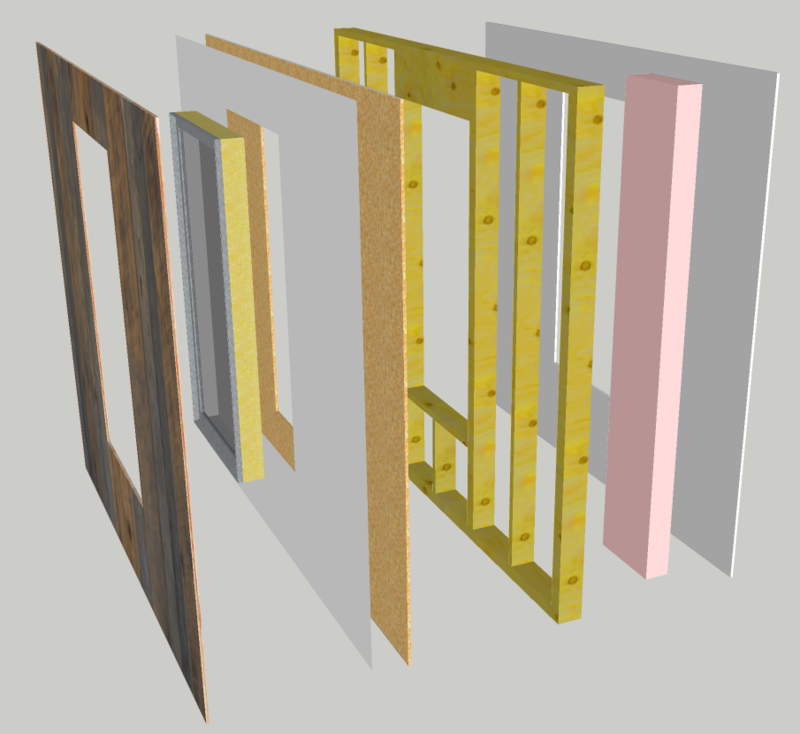 In one section of wall, I have a 5 1/8″ x 28″ x 18′ glulam beam (a header over a bumped out section of the great room). My architects affectionately refer to this a “glu-wall.” I’ve resigned myself to filling my walls with wood and steel (to keep the house from falling down and to realize the architectural vision), but this reality smashes the ideal vision many of us have a well insulated wall. The building code lives with the delusion. Code requires R-18 (or whatever…) but that is the measure of just the fluff that is put in the cavities of the wall. It ignores the overall thermal performance of the wall system factoring in the windows, doors, wood, and steel. The net average R-value of the wall is just R13. Not so hot. To add R values of areas arranged in parallel, calculate the “conduction coefficient” of the material first, U = 1/R. Then calculate the area-weighted average of the conduction, e.g., Unet = p1 x U1 + p2 x U2, where p1 and p2 are the fractions of the wall for each material. Then invert that value to get the net value of R for the system, Rnet = 1/Unet. And therefore the net R value is just 1/0.136 = 7.3. Really not so hot. I’m afraid the situation is even worse than you say. Adding R-values works fine for layers going though the wall (i.e., layers acting like resistors in series) but when you’re adding up areas (“connected” in parallel) then you have to use the area-weighted U-values. Consider an extreme case: a wall which is 90% R1 and 10% R1000 (maybe somebody’s got hold of a Shuttle heat shield tile ). Its overall transmission of heat will be so dominated by the effect of the poor insulation that it’s obviously silly to think the overall R-value is 1 × 0.90 + 1000 × 0.10 = 100.9 when it’ll actually only be a tiny amount over R1. The overall R-value will then be one over that: 7.33455. Of course you’re right, Ed. I’m embarrassed to have made this error. Correction noted. How does this change your view on the energy tradeoffs you made? Would you go back and do it over again with SIPs, to get a higher effective R-value? SIPS are a nice technology, however they were not consistent with the budget or schedule of this project. Conventional stick-built construction in 2008 was the way to go because no one had any work and so I could get a framing crew at very low cost. The SIPS would have been much, much more expensive. (We did use a SIP panel for the roof however, just a 3″ sandwich of OSB and foam — that didn’t require any fabrication — stock item.) Also, there is a lot of glass in this house, and with conventional (i.e., reasonably priced) windows, most of the losses are through the glass, so I doubt we would have got more than a percent or two energy savings using SIPs. Adding to this logic is the fact that natural gas is nearly free in Utah, so utility bills are very, very low ($1000 per year). Very hard to justify 10s of thousands of additional construction cost to save $50/year in energy cost.